Do you enjoy your commute? Innovative bike infrastructure can make cycling a fast, fun transport option. Photo by Justin Swan/Flickr. Instead of sitting in gridlock on a busy road at 8:30 am, imagine cycling safely in dedicated lanes for a quick, pleasant commute. Many cities around the world are making investments that will give residents a faster, safer cycling experience through innovative infrastructure and urban design. Though this list is not comprehensive, TheCityFix has compiled four of our favorite recent examples of cities innovating to prioritize cycling infrastructure and active transport. 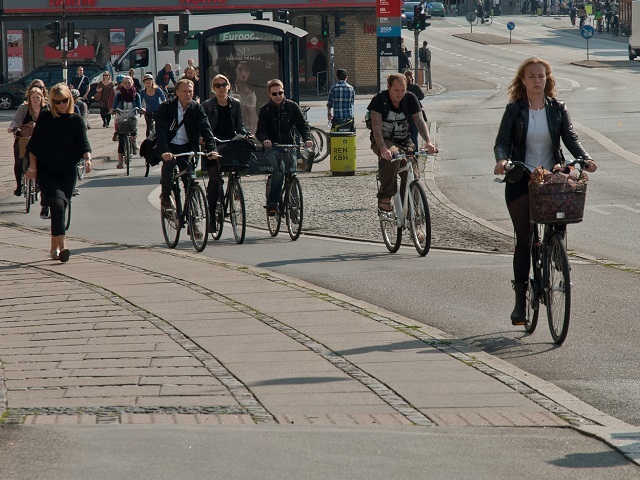 One cannot discuss cycling infrastructure without mentioning Copenhagen, Denmark, where more than one third of the workforce commutes by bike. The city is so bike-friendly that any bike commuter would find it hard to resist moving there. Recently, the government introduced an 11-mile bike superhighway designed to help cyclists avoid traffic lights and save time commuting. If cyclists ride 20 kmph along the superhighway, they will continue through green lights the entire way. Cycling’s modal share has risen from 36% to 41% in Copenhagen in the last year, while car usage is down. The best may still be yet to come for the city’s bikers. Copenhagen is currently investing in six new bicycle and pedestrian bridges over its harbor. Riding bikes in Copenhagen is made even more enjoyable by amenities like trash cans angled for cyclists, and bike pumps and footrests along the bike highway. Portland, Oregon, United States is working to avoid the car-centric mindset common amongst North American cities, and is currently building the largest multi-modal car-free bridge in the United States. Called Tilikum Crossing, the bridge will carry light rail trains, streetcars, and buses and will feature pedestrian and bike lanes on both sides. 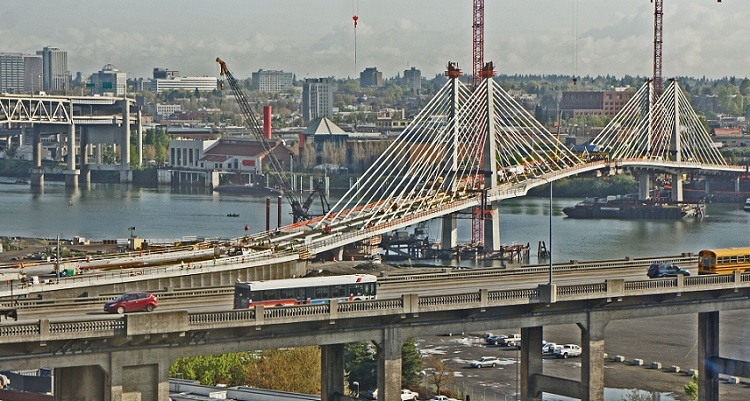 Expected to open in September, 2015, Tilikum Crossing will connect the area’s burgeoning Southeast region with downtown Portland, providing an alternative for residents’ daily commute. Instead of moving cars, Tilikum Crossing is advancing a transit-oriented development (TOD) scheme that prioritizes people’s mobility needs and improves quality of life. Tilikum Crossing adds to a number of Portland’s biking innovations, including “bike boxes” that improve road safety at intersections and “bike trains” that consist of groups biking together on pre-planned routes. Portland’s openness to innovative bike infrastructure projects is one reason why it has been ranked as the most bike-friendly city in the United States. Photo by Roger/Flickr. The proposed Veloway in Melbourne, Australia would be creatively integrated with road infrastructure by traveling 10 meters (32 feet) above six busy intersections. The bike highway would be 2 kilometers (1.2 miles) long, and would be built adjacent to an existing elevated rail corridor between two downtown train stations. Estimated to cost about US$ 20 million, the proposed bike superhighway would avoid the busy streets below and thus improve safety, which can be one of the most prevalent deterrents to urban cycling. The project, however, has run into funding challenges like some bike highway proposals before it. The state government declined to pay for a feasibility study to move the project forward, though proponents are still pushing to advance the proposal. While demand for cars is on the rise in China, bikes remain a prominent part of the country’s transport mix. The government of Hangzhou invests heavily in cycling infrastructure, and has what has more than once been called the best bike-share program in the world. One of the keys to the prevalence of cycling in Hangzhou is the innovative bike lane design. Hangzhou’s bike lanes are often as wide as vehicle lanes on main streets, and are separated from cars with barriers or landscaped islands, as shown in the picture below. 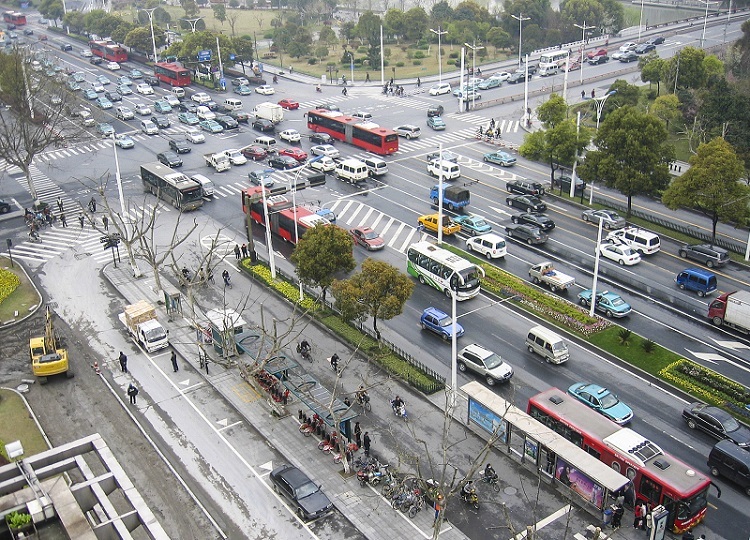 Back in 2005, then Mayor Qiu Baoxing criticized other Chinese cities for eliminating their bike lanes to benefit cars, and instead supported cycling culture as a means to mitigate traffic congestion. Hangzhou’s approach shows how a relatively low-cost infrastructure change can create a safe, pleasant cycling experience. Instead of building more roads to accommodate cars, cycling infrastructure like bike highways, bridges, and dedicated lanes improve physical health, relieve traffic congestions and reduce air pollution among other benefits. Cities around the world can learn from these innovative cycling infrastructure plans to shift away from a car-centric culture towards one of active transport, and create a healthy, happy citizenry in the process.